The now-completed levy-funded Australian olive oil code of practice implementation (OL13007) project focused on three key areas of the industry – formally certifying Australian olive products; monitoring industry compliance with quality standards, which included regular market surveys; and building skills and capacity through training programs. 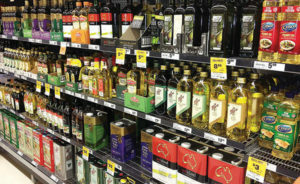 Code of Practice Administrator, Peter McFarlane, said market surveys have shown that consumers can be confident they’re receiving value for money in buying Australian extra virgin olive oil (EVOO). 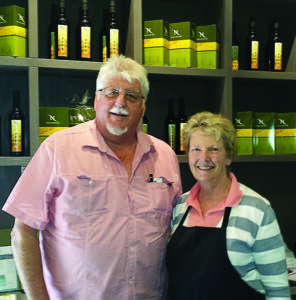 Peter McFarlane with Annetta Paterson at Nullamunjie Olive Oil Pty Ltd Cellar Door in Tongio, Victoria. Many overseas competitors have also shown recent improvement in the quality of their products, making Australian consumers the winners and serving as a reminder for Australian producers not to become complacent in delivering high quality EVOO products. 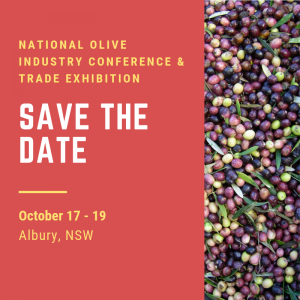 The project provided for certification of local olive products in both domestic and export markets, through the OliveCare™ Code of Practice set and maintained by the Australian Olive Association. Mr McFarlane said seven trade marks were registered for use – three for olive oil, two for flavoured olive oil, one for table olives and one for manufactured products containing olive oil. 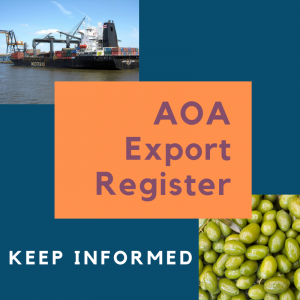 Regular national market surveys of local and imported product were carried out to assess compliance with the Australian Standard for olive oil, the voluntary standard for table olives, the ANZFA Food Standards Code, and Australian Consumer Law. Over the past three years, a total of 176 Australian and imported olive oils labelled as EVOO were purchased from supermarkets, independent retailers or online and tested for chemistry, sensory properties and freshness under the OliveCare™ Code of Practice protocols. The oils tested were from Australia, Italy, Spain, Greece and other countries in the European Union. 16 to 63 per cent meeting the quality requirements in 2017,” Mr McFarlane said. 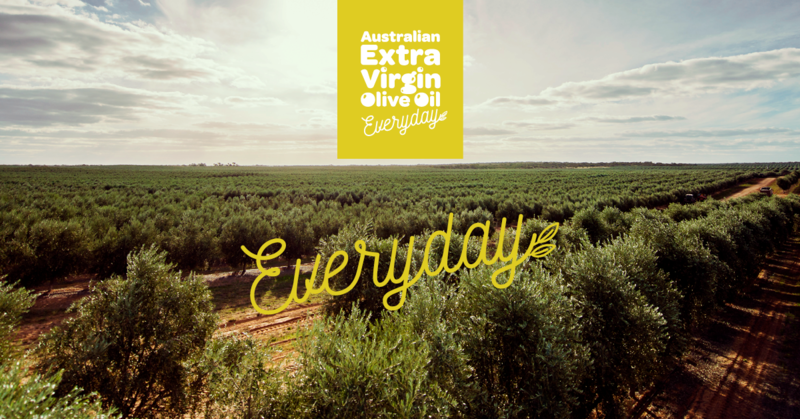 This compares with 73 per cent of Australian products that met the quality requirements for EVOO in 2017, up from 60 per cent in 2015-16. “This may be because Spain and other European suppliers have low stocks so aren’t sending older oil to Australia, and possibly because we’ve put a lot of pressure on competitors with our consistently higher quality Australian EVOO products,” Mr McFarlane said. 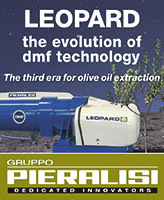 “But we have to give credit where credit’s due, because there’s been a big turnaround in the quality of imported oils. We can’t afford to be complacent and we can’t rely on negativity towards overseas product.” Mr McFarlane said while consumers can be confident they’re getting premium quality Australian olive oil and value for money, local producers must pay increased attention to stock control as 30 per cent of the EVOO tested was not as fresh as it could be (37.5 per cent of imported and 23 per cent of Australian products). “We will work with those companies with failed products to identify causal factors and how to rectify them, as well as providing constructive feedback to other brand owners,” Mr McFarlane said. The project also aimed to boost olive industry skills and capacity through Code of Practice training programs that involved regional olive associations. The registered training organisation River Murray Training (RMT) has developed a suite of six accredited e-learning modules to support the Code of Practice, including implementing a HACCP-style food safety and food quality plan, export readiness training and sensory assessment training for competition judges of EVOO and table olives. All e-learning modules are designed to link to relevant national training competency standards that comply with the Certificate III in Food Processing. Six olive industry enterprise trainers have been trained by RMT to deliver Code of Practice training modules to olive producers in collaboration with state and regional olive industry associations. However, Mr McFarlane said the training program had highlighted a dilemma. While an online e-learning format enabled the olive industry to reach more growers, the growers themselves said they preferred face to face training. “We’ve haven’t got the resources to implement workshops to build skills and capacity, but we need to combine the online and face to face components to satisfy growers’ preferences,” he said. 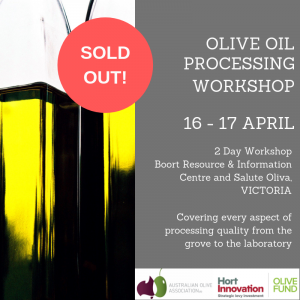 “Part of our project was equipping trainers with the skills to deliver the workshops, so if we need these trainers to deliver regional courses, it may require resources from the state olive associations to achieve a better uptake of technology and the learning materials.” This project was funded by Hort Innovation, using the olive research and development levy and contributions from the Australian Government. Hort Innovation is the grower owned, not-for-profit research and development corporation for Australian horticulture.